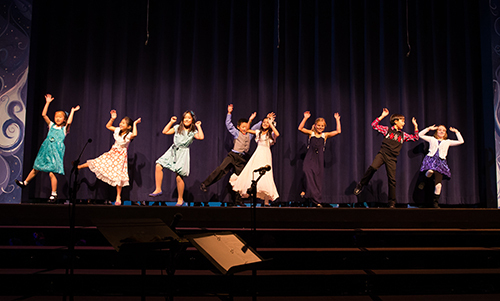 The grades 2-3 holiday show, titled “The Most Wonderful Time of Year,” packed the Bucknall Theater on Dec. 19, as the students in both grades celebrated the season with holiday songs both new and old. Directed by Carena Montany, the show began with students in both grades singing the holiday classic “It’s the Most Wonderful Time of the Year.” They continued with more seasonal favorites, including “Feliz Navidad,” “Little Drummer Boy” and “Winter Wonderland.” Their repertoire also featured nods to other cultures, such as the Liberian folk song “African Noel” and the Hawaiian Christmas anthem “Mele Kalikimaka.” The choreography by Kimberley Teodoro and amusing narration by students between songs kept the atmosphere light and provided smooth transitions between performances. Paul and Toni Woodruff accompanied for the singers on piano and violin, respectively. The show ran smoothly thanks to the efforts of longtime technical director Danny Dunn and assistant technical director Carol Clever, as well as Dunn’s grade 5 technical theater students.